Shanghai Dream Lasers Technology Co., Ltd. has been the professional manufacturers and original suppliers of DPSS Lasers, Precision optics components and Crystals with top quality, unbeatable prices, prompt delivery and the best technical support and services, for science users, commercial customers and industrial manufacturers all over the world.The professional engineers with state-of-the-art technologies in R&D department consistently improve our existing products and develop more new products and technologies. Base on our R&D project, we can supply new products and advanced technologies for OEM customers with complete support from sample to mass production. Shanghai Dream Lasers Technology Co., Ltd., has 800-square mater air decontaminated lab with ten-thousand-level for laser manufacture and experiments, which can keep 23 degree C constant operation temperature for 365 days, 400-square mater office area offer a good work surrounding and condition for our personnel. 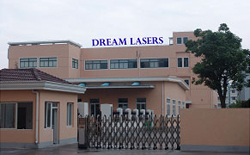 Shanghai Dream Lasers Technology Co., Ltd., has a very strict control on manufacture course. Our company has been certificated by ISO9001-2000. And all the personnel in our company have strictly executed it now. Shanghai Dream Lasers Technology Co., Ltd. will be pleased to cooperate with our OEM customers and further establish strategic-associate relationship. Please keep in mind that Shanghai Dream Lasers Technology Co., Ltd. will be your best partner and supplier in DPSS Lasers, Precision Optics and Crystals in the future. We are ready to provide our best products and service for you from now. Copyright В© 2002-2018 byВ Shanghai Dream Lasers Technology Co., Ltd.